Today, I'm flashing back to August 27th, 2007. We were headed to a campground in Quebec. 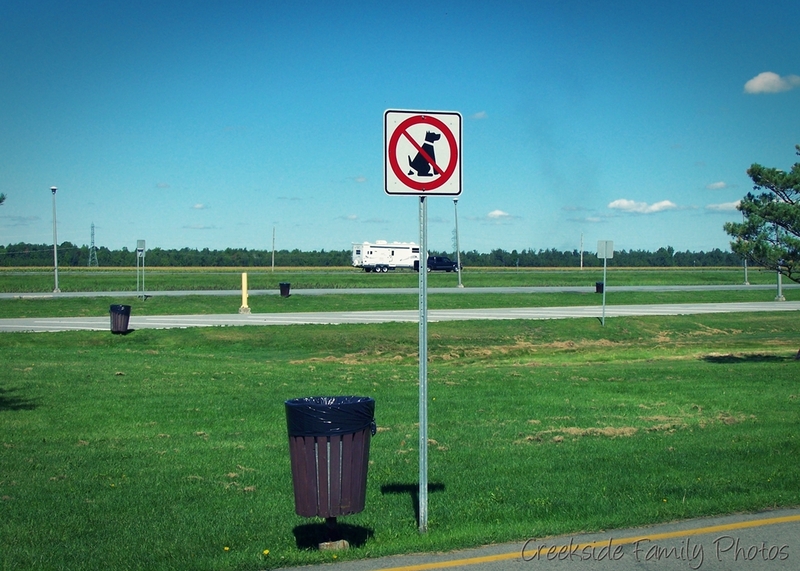 We were at a rest stop on the way there, just inside the province of Quebec. It was a beautiful day. Blue, blue sky, and lots of sunshine. Apparently, dogs are not allowed to... well, go. French grass is too pretty. No doggie doo-doo allowed to spoil it's perfection. Who knew that doggy doo doo was too pretty for French Grass. Ha ha. I want that sign. They should have had a gift shop. LOL my neihbor has two huge dogs who leave us surprises every morning! I should get that sign made and put it out front! lol! ur newest follower! Hello! That sign is too funny! I found your blog through Mama's Little Nestwork and I love it. I can't wait to read future posts. I'm your newest follower. That's made me giggle. Now doggie, just do your walk and hold it in until we get home!